The new elements on "Restos de Un Incendio" are the remains of the fire, the marks left by time and agitation. 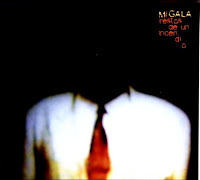 Songs that were written and recorded between 1997 and 2000 and were released with similar names on any of Migala's three LPs have now been recorded in a spirit best fitting their present state. The ten compositions are something that they once thought were finished. But here they appear changed by a fire that, though it hasn't succeeded in consuming them, has managed to erase the most superficial layers of paint. The band seems to wrestle with something well known, yet seem to be discovering it all over again. This record contains what was left when the fire, fed by the recording of their album "Arde" and livened by the months of touring, finally died out. The ashes are still glowing, symbolizing the end of an age and, perhaps, the beginning of something new.